Two Canadian youth – both from Vancouver, BC – have been awarded for their innovative designs at the Toyota Dream Car Art Contest global awards ceremony in Japan. Their artwork was selected from amongst approximately 830,000 entries in this year’s contest, representing 79 countries across the globe. 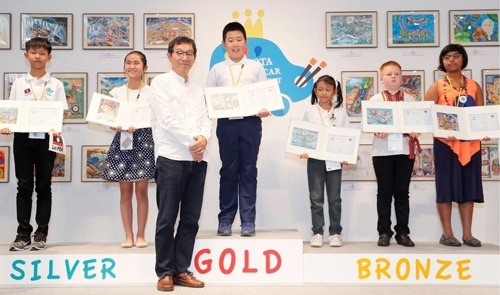 For 10-year-old Ryan Liang, who claimed the gold medal in the 8-11 age category, it was his first year attending the Dream Car Art Contest awards ceremony, and he was thrilled that the time and hard work he put into drawing his artwork was recognized. 13-year-old Noelle Yau, who won silver in the 12-15 age category, was also a previous Dream Car Art Contest finalist in 2015. This year, she returned to Japan with her parents. As part of their trip to Japan, the two Canadian children and their families spent the week participating in workshops, learning about Japanese culture and history, touring the Toyota factory, and sightseeing in Tokyo.